The FLORA exhibition is fast approaching and I have been busy making the usual preparations. The 2018 calendars have been designed and a fresh batch of cards are looking fabulous in their new card stand. Time has flown, we are already over half way through the year and I cannot believe it has been six months since my last blog. I had rather a slow return to painting after the ‘Blooming Wonderful‘ exhibition last November, experiencing ‘artist’s block’ with a collection of paintings that I had hoped to exhibit with the Royal Horticultural Society in 2018. 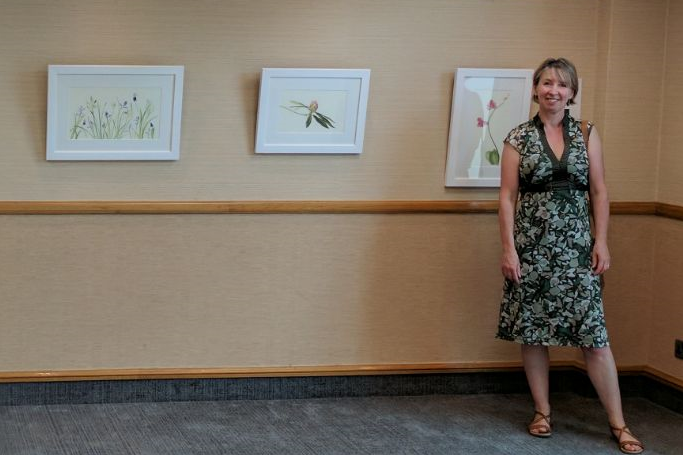 It was a pleasure to exhibit six paintings from the ‘Blooming Wonderful‘ collection recently at the Sheffield Chamber of Commerce Summer Barbecue – a good contrast to my solitary existence in the studio. Today’s walk around Bradfield was the perfect post-exhibition tonic. A chance to stretch my legs and reflect upon a fabulous weekend at Hector’s House. Thank you to all who visited and apologies to anyone who didn’t get a chance to chat to me, there seemed to be an endless stream of visitors! Delighted to have sold 10 original paintings, many cards & calendars and several print orders too. If you are interested in purchasing anything please email me, all the Blooming Wonderful paintings can now be seen on the website gallery page. Time for me to think about my next project! Three weeks until the ‘Blooming Wonderful’ exhibition in November and the planning is all coming together. Louise exhibited a selection of paintings from her ‘Blooming Wonderful’ collection at the recent Sheffield Chamber of Commerce and Industry President’s Dinner held in the Sheffield Cathedral. 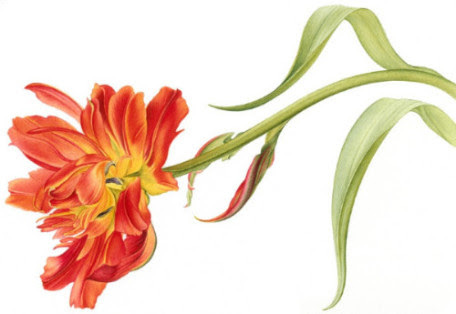 Her painting Tulip ‘Queen of the Night’ had been donated for auction and raised £2000 for the chosen charity, St Luke’s Hospice. To keep up with the times and give my website a more mobile and tablet friendly layout I have completely refurbished it using WordPress. I hope you like the new look, I have gone for a minimalist approach to allow the artwork to speak for itself.